Dr. Kjar and Candessa Surgical & Laser Aesthetics offer a convenient way for patients and clients to purchase medical grade products that enhance and optimize treatment results. Salt Lake City, Utah – Candessa Surgical & Laser Aesthetics has been helping patients prepare for and recover from surgery for the last four years. The medical spa is associated with Dr. J. Gregory Kjar’s Utah plastic surgery practice and is located in the same office for the convenience of Dr. Kjar’s patients. Recently, Candessa Surgical & Laser Aesthetics launched an online store, allowing clients to purchase products without the need to visit the practice. Candessa Surgical & Laser Aesthetics combines the practice of medicine and spa therapies in one treatment center. Offering over 330 products, they specialize in treating body and skin conditions in conjunction with physician-supervised aesthetic procedures. Candessa strives to have their patients looking and feeling their best after their cosmetic treatments. Through the new online store, patients can purchase medical grade skin care lines, including products from the gLo therapeutics and Candessa Aesthetics lines. Mineral makeup is also available through Jane Iredale Mineral Makeup. Dr. Kjar, a Utah plastic surgeon, has found that both women and men have concerns about skin texture, sun spots, wrinkles, pigmentation, and acne. As a result, he founded Candessa Surgical & Laser Aesthetics to offer his patients a variety of non-surgical treatments ranging from exfoliation to dermal fillers such as Juvederm® and Sculptra®. Candessa’s medical grade product lines were created to help Dr. Kjar’s clients further enhance the results of these skin treatments. Candessa Surgical & Laser Aesthetics is committed to client satisfaction, whether the client is purchasing a medical grade moisturizer or a makeup brush. “We strive to get the best results by constantly updating our lasers, treatments and product lines,” says Dr. Kjar. All product orders received during business hours ship within 24 hours of the order and can be purchased online via Visa or Mastercard. 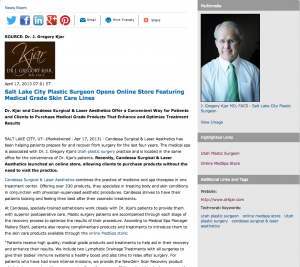 Dr. J. Gregory Kjar is a board-certified plastic surgeon and earned his medical credentials at the University of Utah, as well as at Southeast Michigan’s Providence, Mt. Carmel and Sinai Hospitals. Afterward, he completed a fellowship in craniofacial and plastic surgery with Dr. Ian Jackson at the Mayo Clinic in Minnesota. Dr. J. Gregory Kjar is available for interview upon request.